Custom Cabinets Wichita KS | Milestone Construction Inc. When you’re planning a room addition, kitchen remodel, or other home renovation, custom-built cabinets are a great way to add style and function to the space. 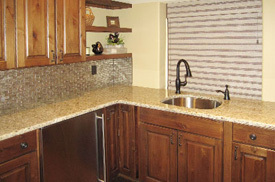 Milestone Construction has been building custom cabinets for Wichita homeowners since 1985. The biggest benefit of installing custom cabinetry and shelving in your home is having storage solutions that fit your space, your family’s lifestyle, and your design tastes. Whether you need cabinets for your kitchen, bathroom, laundry room, or even the garage, we’ll work with you to design a room you’ll love. In addition to maximizing storage space, custom cupboards and built-ins are also a great selling feature, and can add to the resale value of your home. Milestone Construction can create the look you’ve always wanted, including contemporary, colonial, rustic, Mission, Victorian, Euro-style or Shaker. Your solid-wood cabinets will be stained to the finish of your choice. 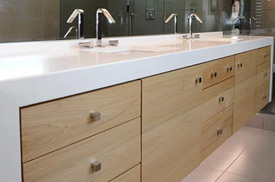 Wood choices include maple, oak, cherry, beech and alder. You can also choose your door and drawer style, and additional features like crown molding and mitered cabinet doors. Your custom cabinetry and shelving will be functional, stylish, and built to last. 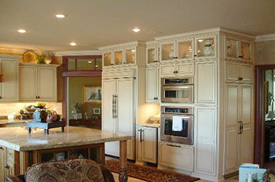 Cabinetry is an important part of any kitchen remodel. The right layout and design can make your kitchen more stylish and functional, improving the work flow to make entertaining and food preparation easier. Milestone Construction can create cupboards that are custom-fit to give you storage options for every nook and cranny of your kitchen, laundry room, bathroom or workshop. From giving your appliances a built-in look to options like custom range hoods, appliance garages, lazy susans and roll-out shelves, we’ll help you create the kitchen you’ve always dreamed of. Whether your bathroom is big or small, we can create a design with a look you’ll love that incorporates the storage you need. Vanities, medicine cabinets, and built-in shelves can help you make the most of your space. If you’re adding a bar as part of a basement or other home remodel, or you want to update an old bar, choosing custom cabinets opens up a whole new world of options. From built-in beverage coolers, to stemware holders and wine racks, you can create a functional bar that reflects your style and becomes a focal point of the room. Creating functional laundry rooms and mud rooms is a growing trend in home building and remodeling, and a major component of these rooms is the cabinetry. Custom-built features like a folding table, integrated washer and dryer, hanging rods, custom benches and coat racks add style and functionality to even a small laundry room. Storage cabinets for the garage don’t have to be made of plastic or stainless steel. You can maximize the space in your garage or other utility area with stylish, long-lasting custom-built cabinets and shelves. Get the storage you need for tools, golf clubs and other sports equipment, hunting and fishing gear, lawn mower and other gardening tools, recycling containers and more. You’ll appreciate our craftsmanship and residential remodeling and construction experience. As a general construction contractor, we’ve been serving homeowners in the Wichita area since 1985. We pride ourselves on having highly-satisfied customers, and our top priority is providing exceptional service and workmanship on every project. Our high-quality, custom-built cabinets are just one of the many services we offer, so if you’re planning a kitchen remodel, room addition, bathroom renovation, or want to upgrade your outdoor living space, contact us today for a free estimate.